You may remember my post from last August titled 100,000 Monthly Page Views & No Backlink Building. 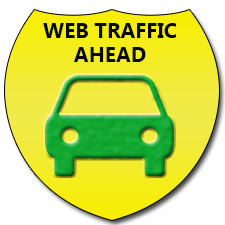 So I wanted to update you on the traffic to my hidden WordPress website I created in 2011 that I have been using to test how much organic traffic I can build without chasing backlinks. Since the last post in August, I’ve added roughly 20 pages. For the record, a few people were suspicious/curious about the tool I’m using to track the traffic because they didn’t recognize the above graph. The last post generated a bit of confusion. People didn’t understand how I could build so much organic traffic without backlinks. For the record, I never said this site doesn’t have backlinks. Of course it does. However, they were earned naturally. The point is, I haven’t been chasing or manually building backlinks through guest posting, linking schemes, etc. I have simply been writing content and targeting longtail (less competitive) keywords. Lisa this is a very cool post. Thanks for sharing your experience with this! Other than making a squidoo page early on that links to our site and literally only having our website address in one signature on one forum related to our niche, we have done no backlink building at all. We are ranking #1 for our original keyword that I targeted at the beginning and #3 right now for another larger keyword in the niche. We are getting around 40,000-50,000 page views a month right now and hope to keep increasing this! I have never done a guest post and have focused mainly on content and SEO. The SEO mainly being on page SEO. I tell my girlfriend who is actually my partner on the website now all the time about the things you recommend and how you do things. Cool post here and very encouraging for us! It is funny, I was not expecting us to hit the top of our keyword as soon as we did so I have focused most of my efforts and research into content and basically how to get where we are now. Anyhow, most of this was done without any backlink chasing at all. I just never really got around to that. Once it became about content, it just has been about that ever since. Thank you for your ethics, your inspiration, your attentiveness to questions even though you must have a thousand or more a day and for this post! Can’t wait to hit 100k! I do have a similar experience as seanguy75. I have a website in a hard-fought photography related niche. I posted a lot of good content based on my experience as a freelance photographer (one of my hobbies), and also some research done on the web. I did not build any backlinks for this site and let it sit – pretty much forgot about it while I got tied into various other assignments. A few months later I noticed that my website was ranking in the top 5 results for several two-word keyword phrases with two of them being in the top three. It is a simple site with pure content and no monetization – not even Adsense on this one. I am planning to add more content and monetize it though, hoping at the same time that its stays afloat at the top! You can join this conversation on Website Babble here. Let me make one thing clear. Building a business that relies solely on SEO is a dangerous game. That is not the point of this post. If you’ve been following me long enough, you know that my business is not SEO dependent. This is just an experiment. I just want to show that yes, in 2013 it is still possible to build decent traffic without chasing backlinks. Of course, a lot of variables have to come into play (niche choice, competition, the quality of the earned backlinks, etc.) however it is still possible. Too many people today are still targeting competitive/broad keywords and their sites are not focused enough around a central theme. And I actually think this site would have even more traffic had I done this experiment before Google started favoring brands in late 2010. With this experiment specifically, it is quite evident how much brands get a lift in the SERPS. So ranking for longtail (less competitive) keywords is where the traffic is coming from (just like Carl’s Disney site). Having said that, I’m not complaining. Getting 150,000 monthly page views (2300 daily uniques) is certainly nothing to sneeze at. I really enjoyed reading all your comments on the last post. Many of you confirmed that you’ve experienced positive traffic results without chasing backlinks as well. Keep the encouraging results and comments coming! How SEO Advice is Making People Go Bonkers Over Links! Are SEO Plugins Overrated? Whaddya Think? Came across this website while reading more about SEO. Though I was a skeptic when it comes to SEO, believe so much in advertising….I decided to take the SEO route last day of last year. The traffic built-up gradually and as at now I average 2500 daily PV and make money with Adsense. Lisa, 2 questions: first, is there a way to find low comp/hi demand niches without paying for software like Market Samurai? Also, as I write this comment it is Feb. 2016. Is your strategy for this site still working? TIA. This site averages about 6,000 visitors per day today. It does have backlinks, though. They were earned naturally. I do think it’s more challenging to do this today. I honestly think Long Tail Pro is the best software out there to do thorough research. You can use free tools like the Google Keyword Planner, but you aren’t going to get the competition analysis. To me, that’s the real value of the software tools. I don’t like Market Samurai anymore. I dont know how it works……even with 300+articles in last 1.5 years my traffic is far from 100000. The niche is EVERYTHING and the key to finding success with this. You need low competition and high demand. This doesn’t work with every niche. I found you on Adrienne’s blog post Magical Mondays, 126 Traffic Generation Case Studies. What a wonderful post you have here and you are the first on the list. Wow, its certainly amazing how much traffic you are getting without back link building. The graphs you showed tell the truth. The back links were still there but they were earned naturally with threads to back it up. What is Babble? I’ve never heard of it. Long Tail Pro looks like a must have program. I looked it up through your post. You have an awesome night and weekend ahead! Thank you for sharing. Great information. If I may ask… how many uniques do you get ? If you don’t want to share that is fine. But very intersting. Have been forever worried about this back linking problem! Can take a sigh of relief finally! This is inspiring! It gives me some ideas where to start! Thanks for sharing this. What no backlinks and so many page views? I realy have to read your article “100,000 Monthly Page Views & No Backlink Building”. Thank Lisa for great post. Every thing is good like long tail + social signals etc… but main thing is content, I think content should be useful and likeable for reader. Now i can wait to make my new website on an EMD domain.. hope that performs well. Lisa, thank you for this great experiment. I am about to make major changes on one of my sites and I don’t plan on getting too crazy about backlinks right now, I want it to happen naturally. I’ll know the results a few months from now. Hi Mike, Right now it’s at about 3,000 uniques per day. This is great news Lisa. You have pointed out an important lesson on this post and that is posting content that your viewers are going to like. This will eventually get you those valued backlinks. The KEY to all this is targeting long tail keywords and finding the right ones for your niche. I find most pay keyword tools overly hyped and over-rated. The free ones work just as well. i got a courage from you. you consoled me Lisa in this bad time when i have lost my hope a going to leave my passion.Very important information i got from this article. i appreciate on your investigations a mind work. Great effort is made by you. you told the things that were not in mind limit. I also believe in natural link building, where your awesome posts attracts natural inbound links from other bloggers who want to link to your great content. SEO could be on-page and off-page. Off-page optimization depends on your on-page optimization which includes ensuring high quality and fresh content in your blog. Very impressive, especially without focusing all your efforts on building backlinks. One question I have is which tool or tools did you use to figure out what are the best keywords to target in your niche? Zero. Nada. I’m not a big keyword tool person at all. I have used Long Tail Pro and if I DO use one, that’s what I use but I didn’t use any keyword tool for this site. Most comes from long tail traffic. No competitive keywords at all. wow, this is inspirative story for me Mrs. Lisa. Thanks a lot for sharing. hm, interesting. so you wrote articles for print media and got traffic? how many did you wrote and what was the prize you paid for all? This article is informative and inspiring. Now I WANT TO build another website. You seriously are a savior! Lisa…I have been telling people for the longest that back-linking IS NOT NECESSARY…just to focus on the content and keep your site looking right and updated. I have 3 major sites that take on MAJOR traffic and we just so happen to have back-links. I have never stressed it. If you look at http://www.PhenomenalMag.com. (Ummm maybe I just created a back-link…I dont know) you can see that our we have very few of them. I have never really cared about Google Page Rank either…Just visitors and more importantly page views. I would love to have you come on and blog about growing a business online…You have a fan in me and you can teach a lot. So YES…your theory works and its profitable…! 1. How many articles do you have? 2. How old is your site? 4. How much traffic do you get now per month? Is Lisa Irby ans me ?? without backlinks can we get more and more pageviews by only updating our site daily ?? Yes, especially if the site EARNS backlinks naturally thru social media, other blogs, etc. The key is to target long tail keywords that are not as competitive. I think the biggest problem is people target phrases that are too competitive. Now that Google favors brands, it’s imperative you go deep into the long tail. Whoa! Impressive? Did you do manual link building or use some other method? How you can say that a site without backlinks got traffic more and more from google listen google pagerank is only for more and more backlinks site if your site has no backlinks your site must appear on google but not click generated am i right ?? Can you outline how you created traffic and how you reached the 50,000 with no backlinks, I think that would make a great post on it own. Sally, I wish I had something more formal, but I literally just started writing content. I don’t even remember how many pages I created per day but let’s just say I created about 15-20 pages in the first 3 months. To this day I do not build backlinks. Google Webmaster Tools is still showing ZERO backlinks but I know I have some. BacklinkWatch.com is showing I have a couple hundred. Make sure you follow my new experiment here https://blog.2createawebsite.com/2013/06/18/creating-a-niche-website/ I will be documenting my process a lot more. Hi, Lisa Great post. i also use Google Adwords to get the best keywords.